In der Kunst, gutem Design und auf ihren Reisen, holen sich Sébastian Germès und Camilla Levai ihre Inspirationen. Ihre Achtsamkeit und besondere Begegnungen veranlassten die beiden dazu, 2012 mit ihrem Label CRAIE auf den Markt zu gehen. CRAIE ist ein französisches Taschen- und Schuhlabel, dessen Name CRAIE Kreide bedeutet. Die Kreide, mit der Großes entstehen kann, das aber ebenso vergänglich ist. Das Gestaltete verwischt. Neues entsteht. So, wie in der Mode jede Saison von Neuem. In der Wiege der Lederfertigung, in Marokko, werden in der eigenen Produktionsstätte in Casablanca, mit dem Team immer wieder neue Techniken entwickelt. Ein Augenmerk liegt auf der Variabilität der Tragemöglichkeiten und der Möglichkeit viele der Kreationen beidseitig zu tragen. Die Rohstoffe werden von Camille und Sébastian exklusiv für ihre eigenen Kollektionen mit den Gerbereien in Frankreich, Italien und Marokko entwickelt. Mit Hingabe und größter Sorgfalt, entstehen aus bestem Leder, achtsam gefärbt und verarbeitet, ganz besondere, langlebige Produkte. Kreationen von CRAIE sind mutig, modern und spielerisch. Die beiden Köpfe der Marke zollen dem Rohmaterial größten Respekt und haben große Freude daran zu sehen, wie Zeit und Patina ihren Produkten noch mehr Persönlichkeit geben. Die Herbst-/Winterkollektion 2018 von CRAIE wird bei Galeries Lafayette und weiteren 200 Shops in Frankreich sowie ca. 150 Geschäften weltweit angeboten. Sowie 24/7 im eigenen Webshop auf www.craieboutique.com. Sébastien Germès and Camille Levai have always been interested in the Arts, creation and travel from which they find their inspiration. Attentive to the world around them and encouraged by stimulating encounters, they decided to launch CRAIE in 2012. CRAIE is a French brand of leather goods and shoes with an amusing name recalling that little white chalk that has always provoked creations that remain ephemeral; they fade and are recreated again as fashion reinvents itself each season. 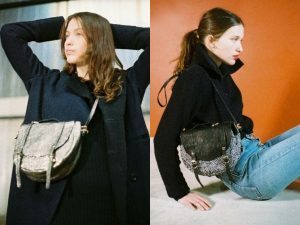 Constantly developing new techniques with expertise of craftsmen, in their Moroccan workshop (the cradle of leather goods), they propose reversible handbags with adjustable straps to adapt to each of our daily needs. The leathers used are developed exclusively for the CRAIE collections, by Camille and Sébastien, in partnership with tanners in France, Italy and Morocco. Each piece of goods is composed with care and singularity in mind; thanks to braiding, caning, blending of materials or customizing with colors of leather, original and unique creations are produced. CRAIE has this resolutely modern vision of leather goods: audacious and playful, without compromising their quality. It is always with the same pleasure that these two alchemists watch this noble material evolve and patina with wear and use. The CRAIE FW18 collection will be available in 13 Galeries Lafayette shops in France, as well as in BHV in Paris, Smallable, Sarenza, and L’Exception international websites. You will be able to find the brand in about 200 shops in France and 150 shops around the world (Spain, Switzerland, Germany, Italy, China, Hong Kong, Taiwan, Australia, USA etc…).